Fiction – Kindle edition; Faber and Faber; 240 pages; 2009. The only Kazuo Ishiguro book I have read is Never Let Me Go, which was shortlisted for the Booker Prize in 2005. While I found it a slightly frustrating experience, I was intrigued enough to add a few more of his books to my TBR, where they have steadfastly remained for about five years. 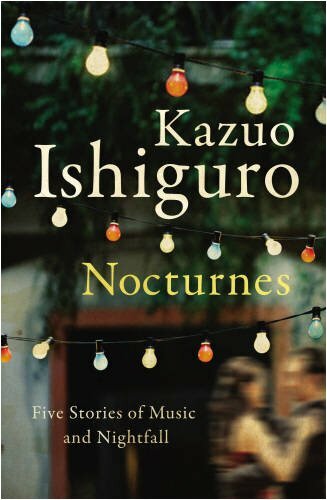 When Ishiguro’s latest book, Nocturnes: Five Stories of Music and Nightfall, was chosen by my book group, I was delighted to have the opportunity to finally read more of his work. As the name suggests, the book is a collection of short stories, each of which is themed around music and/or nightfall. The choice of the word nocturne is a clever one, given that it means a musical composition that is “appropriate to the night or evening”. Its other meaning — “an instrumental composition of a dreamy or pensive character” — would also be a good description of Ishiguro’s prose style, which is languid and dream-like throughout. All five stories are lovely, entertaining reads, punctuated with great wit, and all are told by male protagonists not quite at home in the world or their own skin. In Crooner, which is set in Venice, Janeck, from an unspecified Communist country, meets a childhood hero — an old American crooner, Tony Gardner. Janeck is a musician who plays guitar as part of an orchestra that performs for tourists in Piazza San Marco. He spots Tony in the crowd and introduces himself, and before he knows it he gets to meet Tony’s good-looking wife, Lindy, who appears brash and argumentative. From the outside it would seem their marriage is on the rocks, so when Tony enlists Janek to help him perform a moonlight serenade it seems like the right thing to do… but all is not as it seems. In Come Rain or Come Shine, the narrator, 47-year-old Raymond, lives in Spain and is a bit of a drifter. He is invited to spend the weekend with his London-based friends, Emily and Charlie, with whom he went to university (Emily and Ray share a love of American show tunes). But this is not your average weekend away, because when he arrives, Charlie announces that his marriage to Emily is floundering and he wants Raymond to patch it up while Charlie goes to Frankfurt “on business”. The story is pretty much a farce, in which Raymond, out of his depth, tries to cover up the fact he stole a peek at Emily’s diary while she was at work. It is by far the funniest story in the collection. In Malvern Hills, a young, struggling musician decamps to his sister’s house in the Malvern Hills for the summer. He hopes to spend some down time, working on his music, but finds himself having to help his sister, Maggie, and her husband, Geoff, run their busy cafe. Even though he’s not paying board or contributing to the household bills, he resents having to help Maggie in this way — and there are some hilarious moments when she politely calls him to task, but he never seems to get it. When he meets a middle-aged Austrian couple on holiday in the area, he befriends them — and is intrigued by the ways in which they present one face to the outer world and a different one to each other. Nocturnes: Five Stories of Music and Nightfall is not a particularly memorable read, probably because the “voice” in each story is too similar and there’s little to distinguish one character from the other. There are too many lone male musicians, older American woman and unhappy couples in it for a start. And theming the book around night and music seems like a marketing pitch that doesn’t quite come off. But as a whole, it is a gentle, effortless read — I consumed the book in one sitting — and a perfectly pleasant way to while away a few hours. I need to keep my eyes peeled on what the Riverside Readers are reading each month as I have had this on the TBR for ages and meant to read it, I could have sent my thoughts via satellite… or Polly. It sounds like this is a collection ‘between books’ and ‘for his fans’ which I think a lot of authors do from time to time. They are nice, but nice is about it, I like Ishiguro though so hence why I shall give them a whirl. Sounds interesting, I usually enjoy books conected with music. I read this a while back when it first appeared — liked it more than most did, but wasn’t super-impressed. At that point, I would have been of the “book between books” opinion. What is interesting, and brought to mind by your review, is that I remember each story quite vividly — not just one, but every one. That is highly unusual for a story collection, even one that I like. I think this collection is much, much better than I originally thought (or its overall reputation) and deserves being revisited. Interesting… I didn’t feel the stories were particularly memorable. I based this on the fact that I read the book two weeks before my book group discussion and had to skim read bits again a couple of hours before our meeting when I realised I couldn’t remember a thing about the book!! After loving Never Letting Go and The Remains of the Day I’m determined to read everything by him, even thought the ones I’ve read afterwards were rather meh. I’ve read that this is very melancholic/sad, but it might be another connection to the night/music theme. I must say I really enjoyed the stories but I am an Ishiguro fan … have read every book of his except one. I have my favourites but there’s something about his tone that I love. Never let me go is probably my least favourite but I still liked it. These are his first short stories – or first published collection I believe. If you are interested you can check out my review. (Just check under Author Index).